Eric Guinivan’s music has been performed by orchestras and chamber ensembles across the United States, Europe, and Asia. His works have received several awards and honors, including three BMI Student Composer Awards, three ASCAP Morton Gould Awards, and grants from Chamber Music America, the Theodore Presser Foundation and Meet the Composer. Eric has received commissions from the New York Youth Symphony, Lake Union Civic Orchestra, the Firebird Ensemble, the Michigan Music Teachers Association, ASCAP, the Society of Composers, Inc., the Lotte Lehmann Foundation, and pianist Vicki Ray, among others. Eric began studying percussion at age 10 and is an active performer currently based in Harrisonburg, Virginia. A founding member of the Grammy-nominated Los Angeles Percussion Quartet, Eric has also performed with orchestras and chamber ensembles across the country. Eric made his Carnegie Hall debut in 2011 performing as soloist with the New York Youth Symphony in the premiere of his work Meditation and Awakening for percussion and orchestra. The New York Times subsequently described the work as "engaging," praising its "shimmering colors" and "frenetic energy." Eric has also performed as soloist with the Downey Symphony (California) and the University of Southern California Thornton Symphony. Eric currently curates the new music website Composers Circle, which he founded in May 2012 with the goal of profiling one composer and one piece each day. Now in its third year, Composers Circle has profiled more than 1,000 new works by more than 700 composers and has been visited more than 200,000 times. Eric received Bachelor of Music Degrees in Composition and Percussion Performance from the Indiana University Jacobs School of Music and holds Masters and Doctoral degrees in Composition from the University of Southern California Thornton School of Music. 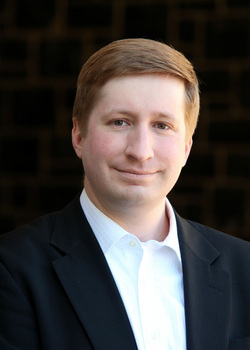 Eric is currently Assistant Professor of Composition at James Madison University in Harrisonburg, Virginia.